Tech Transformation: Is no news good news? Last night I was speaking to my son. I say "night" because it was 11.30 pm and I was in bed. As Joal is currently walking the Pacific Crest Trail, the times when I can speak to him are determined by our different time zones, but more importantly by when he is able to get an internet connection, as most of the time he is in wild regions without a signal. As a mum, I've been nervous about this trip for a while, as there are certainly dangers. Last year I believe 11 people died on this trail, mostly through a lack of water or, conversely, by too much water, being swept away in river crossings. When I go for multiple days without hearing anything, then of course it's a bit of a worry. Well last night Joal was talking to me about the fact that on the trail people are now nervous because of a mountain lion attack which killed someone on the Appalachian Trail. That seemed a long way away from where he is, however after finishing our call I couldn't get to sleep. So in the middle of the night, I got up and Googled "mountain lion kill in US" and what did I come up with but an article in The Independent entitled "Cyclist mauled to death by mountain lion on forest trail near Seattle." Hmmm - not the Appalacians then, but a place where my son and his girlfriend will actually be trekking though sometime soon. And this death happened 4 days ago! Needless to say, this story wouldn't have got onto my radar, had I not Googled it. I wasn't on the BBC news for the regions I follow, for example. After a sleepless night I'm asking myself, is no news good news? I've been thinking about news recently as a couple of days ago I was asked to develop a workshop on information literacy. There is so much "fake news" at the moment that I've been asking myself what it's important to teach students so that they become more critical about what they read. I've also been listening to the podcast Note to Self, which did a recent episode about bots, in particular on Twitter, which are insidious, being aimed to promote fake news and sow chaos. I also read a great article this morning by Dr Alec Couros and Katia Hilderbrandt from the University of Regina about the critical literacies we should be developing in our students at a time when the boundaries between real and fake news seem blurred and uncertain. They point out that fake news is often generated using social media in order to increase web traffic and ad revenue, and also to discredit a public figure. For example there have been numerous stories about the role of the Russians in the recent US elections as well as the Brexit campaign. In fact today anyone can publish anything, real or fake, very easily, especially as we now have the ability to change people's facial images and voices on video to spread fake messages and trick people. How do we teach students to validate information in this new digital age? A couple of days ago I was talking to our iCommons Coordinator at school about checklists for evaluating information. She talked about how she teaches students to use CRAPP (which she refers to as CAARP), but how useful are such tools when we are dealing with an avalanche of information, when fake news is becoming increasingly more sophisticated, where authorship and origin can be falsified, and where world leaders themselves are spreading the falsehoods online? Develop and employ investigative techniques. They suggest knowing about and using sites such as Snopes that will help identify accuracy. I love their suggestion, which I've also used with students, about using Google reverse image search to check whether images have been altered. We do ask students to look critically at websites, but studies show that people are still hugely influenced by false elements of websites such as logos and domain names. In fact the best way to check is to look outside the site itself to see what other sites are linking to it. Finally it's important for students to understand what bias is. We are currently teaching this to our Grade 4 students, however for older students the site Checkology is great for helping students to identify what is news, opinion, entertainment, advertising, publicity and propaganda. Use rich examples. For many years we have taught our upper elementary students how fake websites can look real. We've used Dog Island and the Tree Octopus among others. Couros and Hilderbrandt write that it's also important we use fresh and authentic examples in class, for example things that students might encounter in the news. Nurture a critical disposition. Often students (and adults) believe everything they see, hear and read, so in schools we need more focus on approaches to learning such as critical thinking and questioning. The article, which I really recommend you read, contains an interesting graphic about where popular media fits in a scale of fact to fabricated information. Even with reliable sources that do report facts and news, such as the BBC, New York Times, Time magazine, The Economist and so on, there are still biases, with some skewing more liberal and others more conservative. I was interested to see that CNN is seen as media that moves between a fair and an unfair interpretation of the news, being full of opinion, giving selective or incomplete stories and at times unfair persuasion. Other media such as the Daily Mail and Fox News and not simply skewed, but also often give unfair representations of the news and contain propaganda and misleading information (Fox also includes inaccurate and fabricated information). So back to my dilemma. In searching for information about the progress of my son on the PCT I've come across many blog and vlog posts, as well as other stories about hikers who have gone missing from the trail. I've been trying to put all of these into perspective. For example, yes, someone was mauled to death by a mountain lion on a forest trail a few days ago, however it has only been the second fatal attack by a mountain lion in Washington state in the past 94 years. Really, cycling to work in London every day, was more risky for Joal. 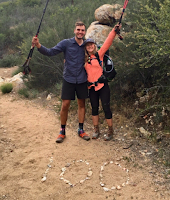 If you want to know more about Joal and Jenny's walk on the PCT, you can follow their blog JWalking. Photo credit: Personal photo of their first 100 miles of the hike.